“Mary Murray, an Irishwoman, aged 30, was indicted for stealing a woollen frock, and other articles, as books, shoes, a comb, and various small groceries, the property of Jeremiah Long, mariner. Jeremiah Long deposes that he lodges at Mr. Metcher’s, in Westgate-street; on Saturday night the 26th of June he locked up his room and went away till Monday morning, when he returned at about seven o’clock on that morning, he found, on entering the room, a window open; two Guernsey frocks, a lot of grocery things, three books, a pair of shoes, and other things had been stolen. From the evidence of Jonathon Fisher, it appeared that at a quarter before six o’clock in the morning, the prisoner was sitting on the Itchen side of the ferry, when the prisoner offered him a woollen frock and a pair of shoes for sale. She wanted ninepence for the frock, and he gave her sixpence for it. She offered him other things for sale. At twelve o’clock the prisoner was seen drunk in St Michael’s square with the books, offering them for sale. A policeman apprehended her for drunkenness, in the High-street, with the books on her, and in her bosom, some mustard, pepper, salt and other things. The prisoner in defence told a long story of coming from Titchfield on the morning of the 28th of June, and at the ferry meeting with a young sailor, who looked respectable, and addressing her said he was hard up and ashamed to sell his things himself, and employed her to do it, and she accounted to him for the proceeds. He gave her the books and the grocery for herself. She got her living by selling knitted caps, and knew nothing of the prosecutor; but she said that it was very unlikely that she should come into the town to sell articles stolen in it. She delivered herself with great volubility and propriety of language’ intermingling the whole with protestations of innocence. 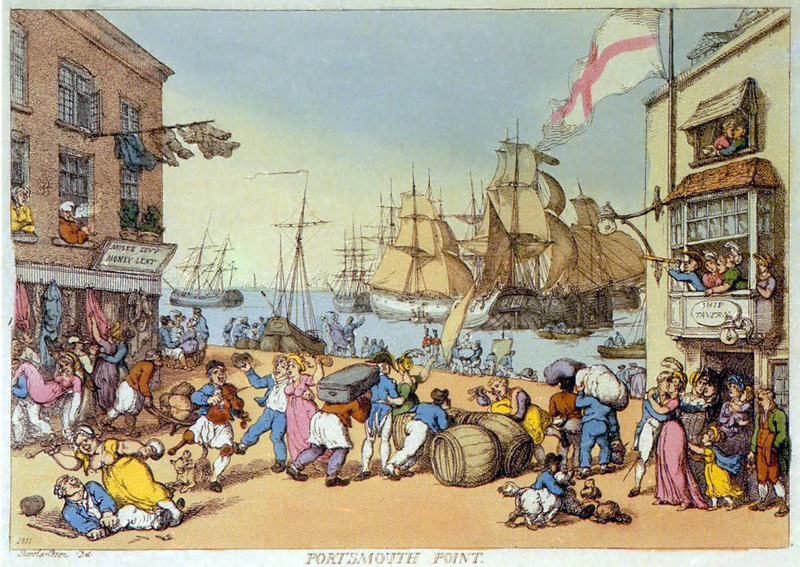 See a gansey in the 1811 Rowlandson print above? Me, neither! I love these posts, fascinating.